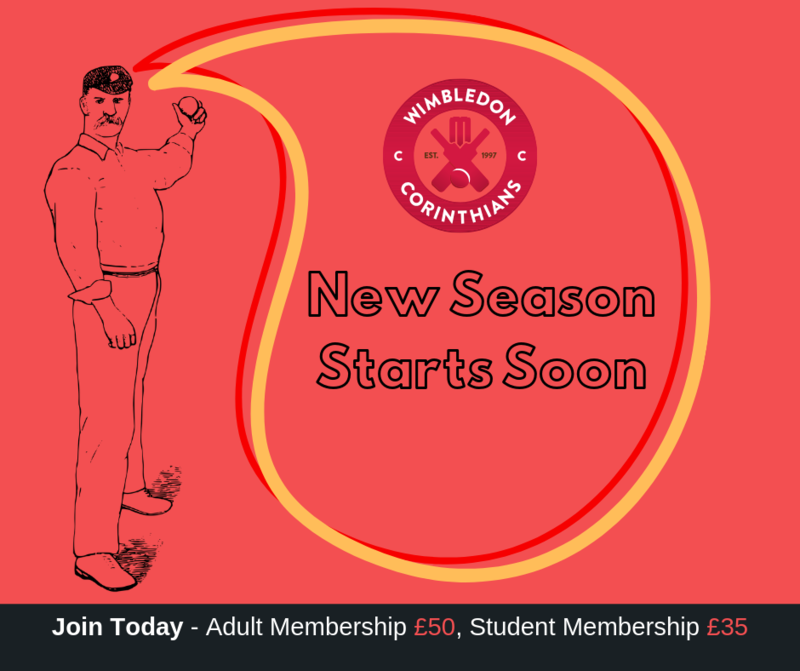 Wimbledon Corinthians now has its own fantasy sports cricket league. 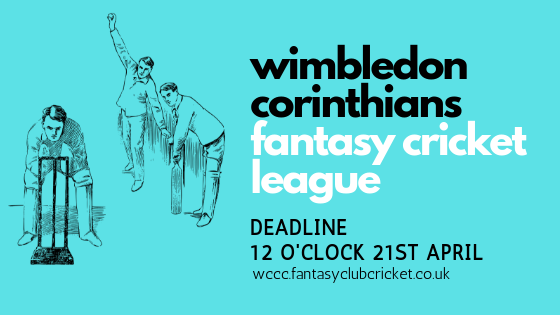 So if you think you have what it takes to pick the best team in the week, come join us at https://wccc.fantasyclubcricket.co.uk Pick a team of 6 players, with at least 1 batter, bowler and wicketkeeper, budgets are limited to £35m. It's free to enter, get you team in by 12 o'clock this Saturday in preparation for the new season. Spring has arrived, and the coming of the extra hours daylight ushers in the imminent start of the new season. It's right around the corner, with our first match starting on the 21st April at Picturesque Woldingham Village. 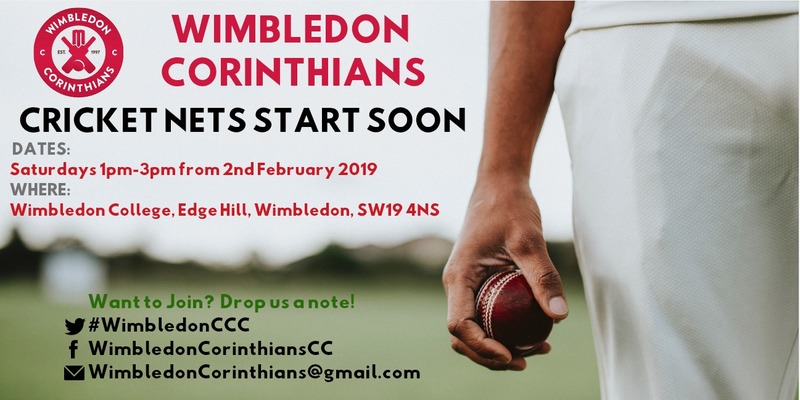 Hope you will join us, make sure to pay membership by the first game, as paid up members for the 2019 will have selection preference for our warm up games before the leagues start. As a team we are very excited for all the new players, and returning players who will participate throughout the year, let's all have fun and play in true corinthians spirit! PS. If you are returning member, membership payment details have been emailed, otherwise use our contact form to get in touch if you'd like to pay membership. 1st XI 7th July: Vs Park Hill, Cancelled due to world cup final related availability issues for Park Hill. 14th July: Lost to Ottershaw and Hamm Moor by 144 runs. An under strength league XI conceded 267, wickets shared around with Sadam, Ben, Geoff and Sai all grabbing two. The batting failed to fire in reply with Ben top scoring with 27 in our measly 123 all out. 21st July: lost to Spelthorne Sports CC by 125 runs. Very much a case of deja vu despite a significantly stronger 1st XI, Spelthorne's 243 for 8 included an 87 from Chris Ward with Kunal grabbing 3 wickets and Rakesh and Ben 2 each. Chris H marked his return with yet another 50, carrying his bat for 57* as only 2 other batsmen managed double figures. 28th July: Lost a close fought game to London Gymkhana by 2 wickets. Batting first Corinthians Lost regular wickets in their total of 188 all out, and took regular wickets as Gymkhana snuck home by 2 wickets. 2nd XI 21st July: Lost to old rivals Epsom Methodists by 104 runs. Old foes Mark Johnson 92* and Matt Yelland 57 got the Methodists to 233-5 off their 40 overs. Wickets shared around with Theo, Steve, KP, Santosh and youngster Shreyas with one apiece. A reasonable start in reply (40-1) turned ugly as the 2nds lost 7 for 31 dropped us to (71-8) Santosh was the only real bright spark with a club best 35 not out. 28th July: Lost to St James CC for the second time this year. A poor batting performance saw us skittled for 76 and meant we were never really in the game. Congratulations to Prakhar though to grab his first hattrick which made it a least a little bit interesting as SJCC coasted to a 5 wicket win. 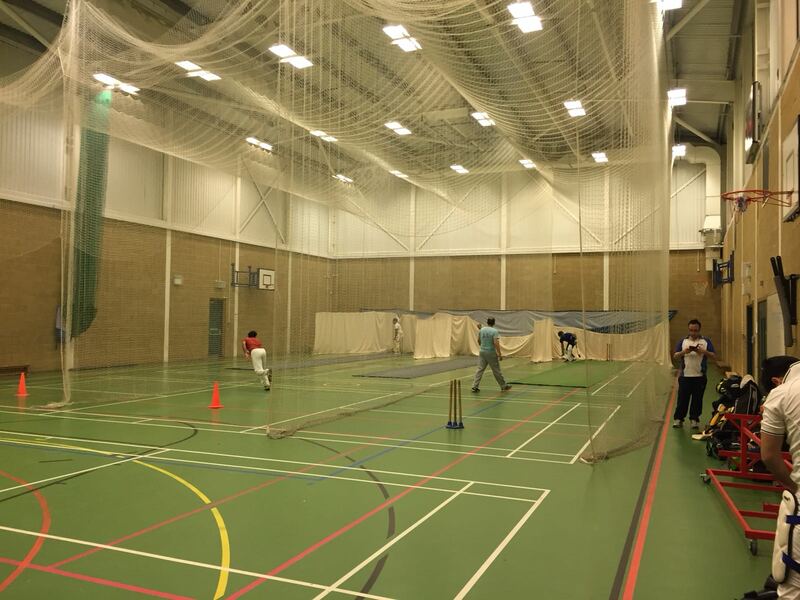 Sunday XI 8th July: Sunday XI (143-5) beat Battersea Ironsides CC (142-9) by 5 wickets, an all round bowling and fielding performance saw 10 bowlers used with wickets for Sunny (2), Santosh, Druva, Ivan and Lalit, Sunny also contributing 2 run outs to the cause. Omkar Joshi was in the runs again with 72 not out and only a late hattrick from youngster Sam Freestone threatened to derail proceedings. 2nd XI on a roll! Wimbledon Corinthians 2nd XI beat Graveney CC by 9 wickets. A clinical chase takes the 1st XI to top of the league table! One of the best performances by Corinthians against a side that put up a testing target for the hosts. The breakthrough was produced with Arun picking up initial wickets. Kunal, Ben, Gopa added on what looked like a good pause to an unstoppable run scoring from Spelthrone. Amit bowled a great spell stopping batters to their crease. Sun Gods looked angry with us too giving cramps and tired legs by the time opp finished their innings @ 255 runs. With little low on bowling, that was expected by 1st XI who patiently followed their simple plan as they made before the match :).. "Bat 45 overs and chase it down" !! WccC openers, Chris (83) and Arun(47), scored 120 in first 20ish overs.. and that gave a solid start for WccC. Sumit and Mezbah added another 30ish in the total as Arun and then Chris finished their part to get us half the target ! But then there was a magic spell from Angus Donaldson.. !! Gopa and Oli took charge of the situation and showed why they made our middle order that day ! A very sensible partnership of 40 runs until Donaldson had another key wicket in his last over - a quick scoring Gopa (24) left the crease @ 200 for 5 ! Kunal went in with his injured webbing and swollen fingers and realized after facing couple if deliveries that he cant hit sixers right from first ball ;).. took his time to get hold of the situation (and grip his bat well)..
With over 50 runs remaining to score in 9ish overs the task was more about holding onto the nerves, not lose wickets and off course score runs ! Kunal scored much needed 41 in 26 balls with Oli finishing on 14 and Ben (5) rotating the strikes wisely to get Kunal face more deliveries to catch up with the required run rate. Was a great win for WCCC with a huge target to chase against a very disciplined attack ! Overall a very good day for the game of Cricket and both teams played very well. Corinthians turned up on Wandsworth Common in glorious sunshine to play a team named after Chris Cairns’ now defunct fudge company. Although the start time was officially 12:00 a number of the team had to guard their cars until the parking regulations ran out at 12 so in the end play got underway about 12:10 with Corinthians skipper for the day Theo losing the toss and being asked to field first. A new ball partnership of Brian and Steve O started well, with Steve producing a devastating spell of 7-4-6-4. Brian at the other end should probably have matched him but had a number of catches dropped or land just out of reach of fielders. With CFCC at one point about 35-4 things were looking very promising. 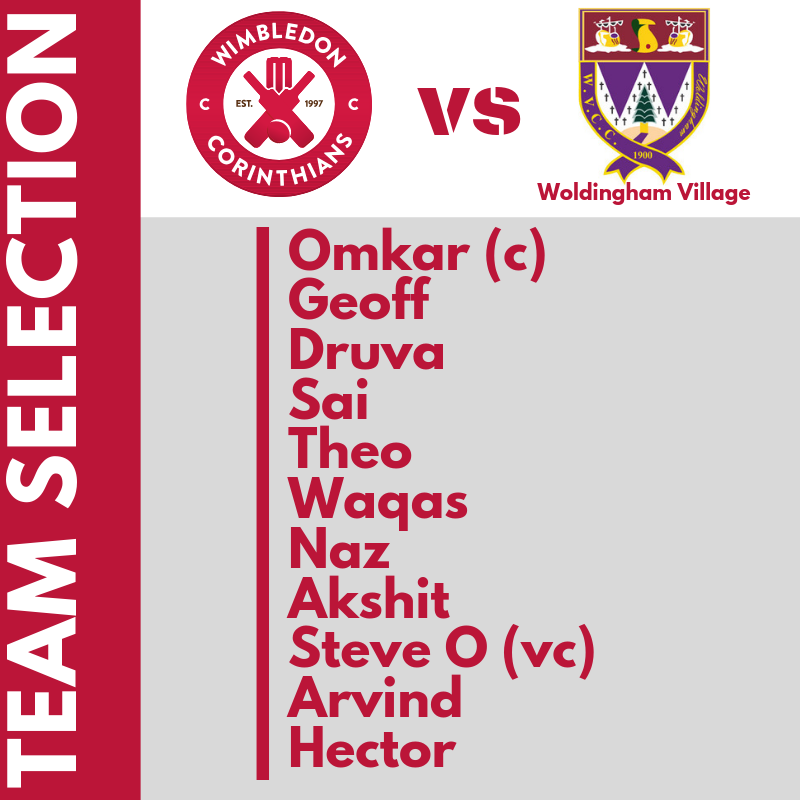 Keith, Amit K and Theo continued on the good work to reduce the oppo to about 70-6 until a finger injury to Theo forced him from the field for a couple of overs. This resulted in Corinthians fielding with 9 for a short while, which combined with CFCC hiding their usual number 3 and best batsman (he ended up last man out on 93 which was half his sides total) at 8 led to a belligerent 90 odd run partnership of which he got about 85. New player Omkar bowled 4 tidy overs of gentle seam (4-1-12-1) in the middle of the carnage somewhere so well done to him. Late wickets for Amit and Theo finally polished off the Fudgers for 186 when a total closer to 100 had looked on the cards. We did stick at it pretty well on a hot afternoon and had we taken our catches that would have helped too…. Corinthians reply soon fell into a bit of trouble with openers Ewan and Omkar both falling for ducks. Waqas and Matt then produced a chalk and cheese partnership of 40 before Waqas was bowled for a powerful 31 (new club best). In the face of some tight bowling Brian and Matt tried to keep things ticking over until Brian lost his patience and his stumps to a very slow spinner trying to deposit him over midwicket. The pitch had been showing variable bounce all game and Matt became it’s latest victim getting pinned by one that didn’t bounce from back of a length, at this point Corinthians had meandered to 61-5 with the asking rate rapidly closing on double figures. Amit and Ivan gamely tried to keep the ruins flowing in a partnership of 42 with both batsmen showing plenty of aggression but Amit having rather more success, Ivan eventually sacrificing himself for the team with a stumping come runout for 9, 104-6. Keith departed soon after to an excellent return catch (107-7). Steve and Theo (who picked up his second injury of the match when he was hit on the chin!) tried to keep Amit company but in the end Amit perished, last man out, to a steepler at mid off for 44. Corinthians closed on 132 all out. If we were to award a man of the match it would go to Cairns’ skipper Stu for his massive 93, well batted sir. (although Steve’s 7-4-6-4 was also a remarkable effort) Well played all.